WASHINGTON — The felony indictment of Republican Missouri Gov. 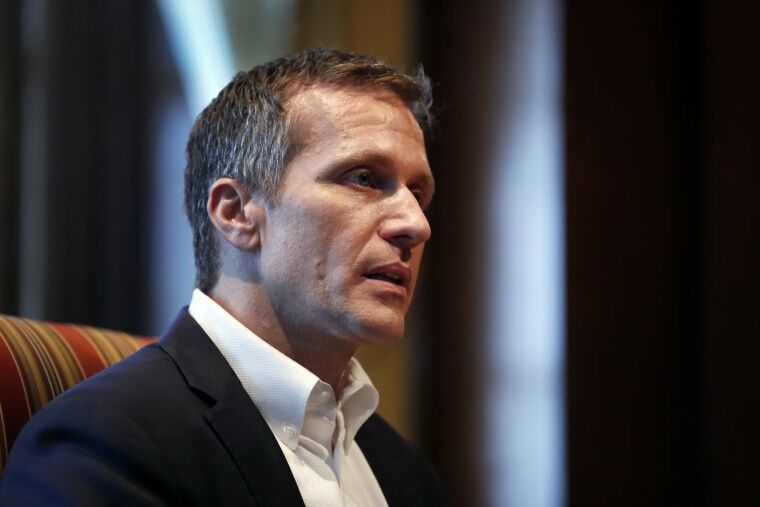 Eric Greitens — for allegedly taking a compromising photo of a woman with whom he was having an affair — could have a ripple effect well beyond the governor’s mansion. For one thing, Missouri is holding one of the most competitive Senate races in the country between incumbent Sen. Claire McCaskill, D-Mo., and likely GOP opponent Josh Hawley, who just happens to be the state’s top law-enforcement official as state attorney general. What’s more, “Republican House leaders said they are launching an investigation of Greitens, which House Communication Director Trevor Fox said is needed before impeachment proceedings could begin,” per the AP. The McCaskill-Hawley race, right now, is viewed as a 50-50 contest, with control of the U.S. Senate possibly on the line for whichever party wins it. And this felony indictment will be in the background. Possibly for months. President Trump is the headliner of the second day at the conservative CPAC confab right outside of DC. He speaks at 10:05 am ET. Here is the rest of the schedule for today and tomorrow. Those words will feed the base, but they won’t comfort wobbly conservative allies. The Washington Post notes that the Russian oligarch whom Mueller indicted last week for being part of the effort interfering in the 2016 election just happens to be the man who controls the Russian mercenaries fighting in Syria. “A Russian oligarch believed to control the Russian mercenaries who attacked U.S. troops and their allies in Syria this month was in close touch with Kremlin and Syrian officials in the days and weeks before and after the assault, according to U.S. intelligence reports. In intercepted communications in late January, the oligarch, Yevgeniy Prigozhin, told a senior Syrian official that he had ‘secured permission’ from an unspecified Russian minister to move forward with a “fast and strong” initiative that would take place in early February.